Great Low Auto Insurance Rates for California Uber Drivers! OnGuard Insurance offers great low rates on Uber Insurance in California. Get the right coverage that will have you covered during all periods of your rides as well as your regular personal use. Get a quick California Uber Insurance Quote Online now or call (888) 997-8683 to speak with a licensed agent today! As an Uber driver, most insurance companies in CA won’t cover you while you’re roaming waiting to pick up your next ride. Your ridesharing insurance company will not provide coverage during this time; neither will a regular auto insurance policy. What you need is a CA Uber insurance policy that offers an endorsement to provide coverage for Rideshare drivers. 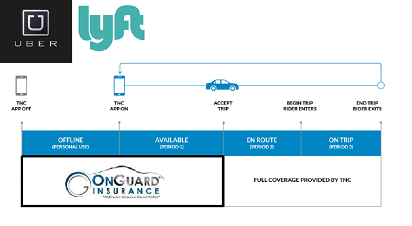 OnGuard Insurance is an authorized producer of Multiple Insurance companies in multiple states that offers a “transportation endorsement”, in California we work mostly with Mercury Insurance to provide coverage for Uber drivers for only about $10/mo. Being one of the most affordable companies already, you’ll probably end up paying less than you were before you needed Uber auto insurance in California. Let OnGuard Insurance help you get covered while saving you time & money… get your free CA Uber auto insurance quote in just a couple of minutes online or call 888-997-8683 to speak to a licensed agent! Why Purchase Uber Car Insurance in California? Transportation Network Companies (TNC) like Uber and Lyft are experiencing explosive growth as consumers embrace this convenient form of transportation in record numbers. The market is much bigger than you might think, as an estimated 500,000 TNC drivers are currently involved in ride-sharing (Uber, Lyft, etc.). Many of these drivers are unknowingly exposed to potential gaps in coverage. In fact, Mercury alone averages about one ridesharing insurance claim per day, and many of these claims are being denied because the personal auto insurance policy only provides coverage when the TNC driver’s ride-hailing app is off. This means that many of you driving for these companies probably aren’t covered under your personal policies. Mercury’s ride-sharing coverage will close that gap and provide a solution by extending coverage during Period 1 of the drive cycle (see illustration). Don’t ride-hailing companies have policies that cover their drivers? In most cases, a company’s full commercial coverage doesn’t come into play until a ride has been accepted. During the time when a driver has logged into the company app, but not yet accepted a ride [Period 1], limited coverage may apply. What about the driver’s personal auto policy? Personal auto policies aren’t designed to extend coverage when transporting passengers for hire. In fact, most personal policies exclude this type of exposure, and many are extending this exclusion to include the time Uber app is on, but no fare has been accepted [Period 1]. When does the Uber insurance coverage come into play? This uber insurance coverage extends drivers’ personal auto policies through Period 1 of the ride cycle, allowing drivers to obtain coverage not provided by their ridesharing companies. Your TNC’s insurance company provides coverage from when a ride is accepted on the app, to when the passenger is dropped off. Our uber insurance policy provides coverage while roaming looking for a passenger and of course for all other personal use. What is the cost of this coverage, and how do I add it? On average, the ridesharing endorsement is about $10/mo. to add. An additional 8,000 miles will be added to the current mileage estimation calculation. A surcharge of approximately 10% will be applied (the surcharge will vary slightly based upon coverages selected). Once you’ve requested a quote, one of our agents will contact you to go over your quote and underwrite the policy, please advise us that you drive for a ridesharing company and we’ll add that coverage on for you. How do I get an Uber insurance in California? Whether you need Uber car insurance, Lyft insurance or Sidecar insurance, OnGuard can have you covered to drive for any or all of the ride-hauling companies in just minutes. Get your free rideshare insurance quote online or call 888-997-8683 to speak to a licensed agent today! We look forward to speaking with you and getting you the right Uber insurance coverage at an affordable price!